Welcome to the Women in AV. Women in AV establishes a multi-faceted approach to educating, supporting, encouraging and inspiring women in the audiovisual industry through collaboration, research, mentoring and networking opportunities. The Women in AV Group will promote the growth and performance of women by empowering women to feel recognized, respected, productive and important to the AV industry. Women in AV, Let’s Take The WAVE Career Pledge! Meet Media Vision’s Women in AV : AV Nation Podcast Ep: 1!! 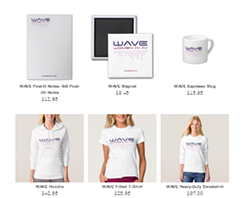 Long overdue,we have all the Women in AV tee's, office gear, and accessories any WAVE will want whether it's in the office, InfoComm16, or running errands in btwn meetings!! Check out everything WAVE at Zazzle's and let us know if you have suggestions abt what else WAVE you'd like to see and can't find. Find WAVE AV Gear HERE! !